Go Fletch! He looks so handsome in his harness!! You should also get him used to the car by driving him around the block every now and then. Most cats are afraid of the car because they associate that with going to the vet. Fletch might protest at first, but if you drive him around regularly, he will most likely chill out. As you know, we take our cat everywhere. She even readily gets into her travel bag. Once we get settled in the car, I let her out of the bag. She’ll explore the car a bit…making sure all her smells are still there, then she mainly sits on my lap for the trip. Good luck! With patience, I think you’ll get there. 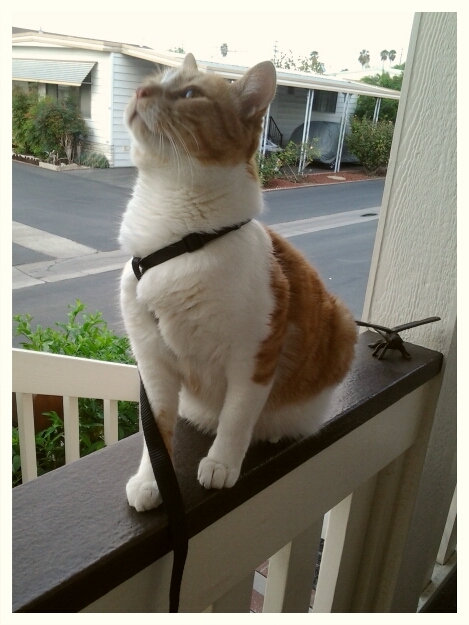 Pam, he IS handsome — with or without the harness. Leslie, I thought about the stroller, but King Arthur isn’t a fan of the cost. Plus, we kind of want him to walk around with us. Being that he’s only ever been an indoor cat, this entire experiment is contrary to everything he knows. Marcie, I’m with you on the short drives. KA wanted to just throw him in the car and take off for Vegas a couple weekends ago, but 1) I nixed that idea as craaazy! and 2) we didn’t go. We still have so much to work on! Fletch is really REALLY NOT a fan of outside. We continue to try, though. We must.